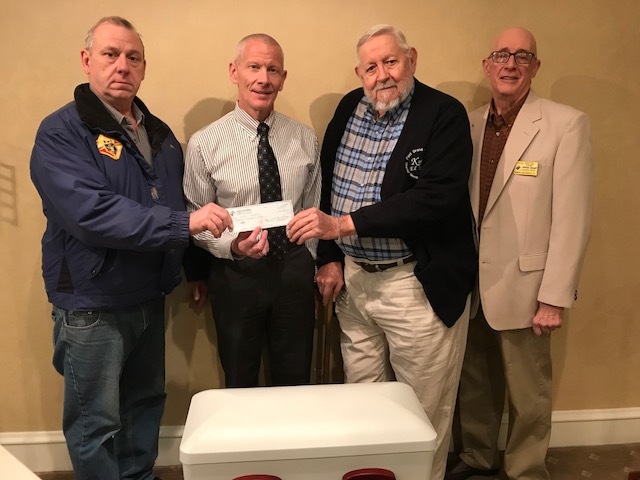 Knights of Columbus Council #6037 (Conneaut Lake/ Linesville) recently presented Steven Mizner, funeral director of the Mizner Funeral Home in Meadville, with $500 toward his efforts to provide free burial services to miscarried and stillborn babies in Crawford County. Mizner has provided about 20 such burials per year to families who were unable or unwilling to pay for it themselves. The donation from the Knights will be used for the purchase of small caskets. It was given in memory of Leo Whalen, a recently deceased charter member of the Knights. Pictured, from left, are: James McAnalley, grand knight; Steven Mizner, funeral director; Ed Kline Sr., Knights charter member; and Bill Greco, Knights pro-life director. Msgr. 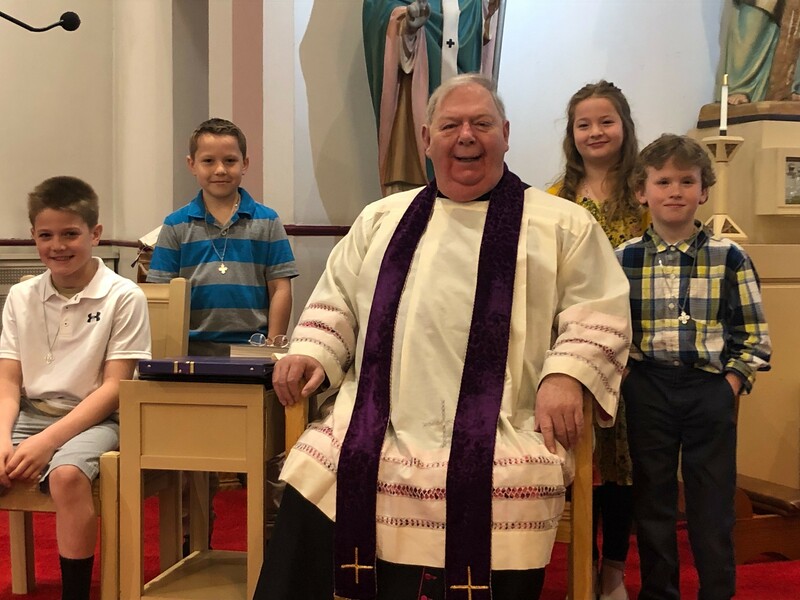 John Herbein, pastor of St. Patrick Parish, Franklin, is always happy when he gets to celebrate a sacrament for the first time with the children of the parish. 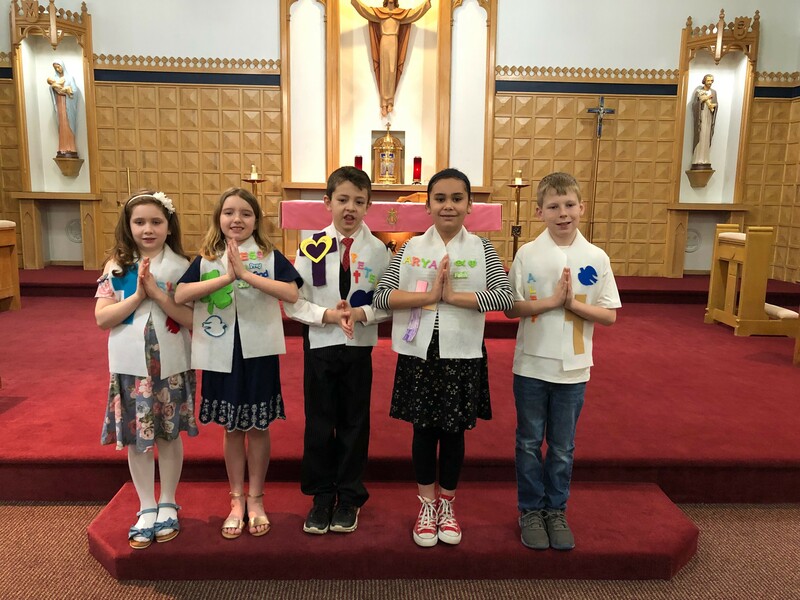 He recently celebrated the sacrament of reconciliation and penance with these four second-graders: Clark Findlay, Cole Rodgers, Nova Morrison and Padraig Johnson. 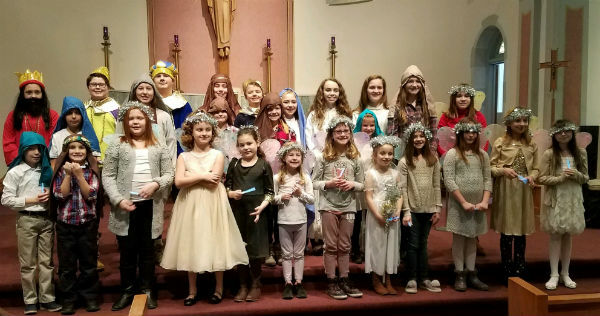 GRAMPIAN --Several children experienced God's acceptance and love when they celebrated the sacrament of reconciliation for the first time through the partnered parishes of St. Bonaventure, Grampian, and St. Timothy, Curwensville. The students, from left, are: Brylee London, Tess Wheeler, Peter Magnuson, Aryan Negado and Alex Pentz. 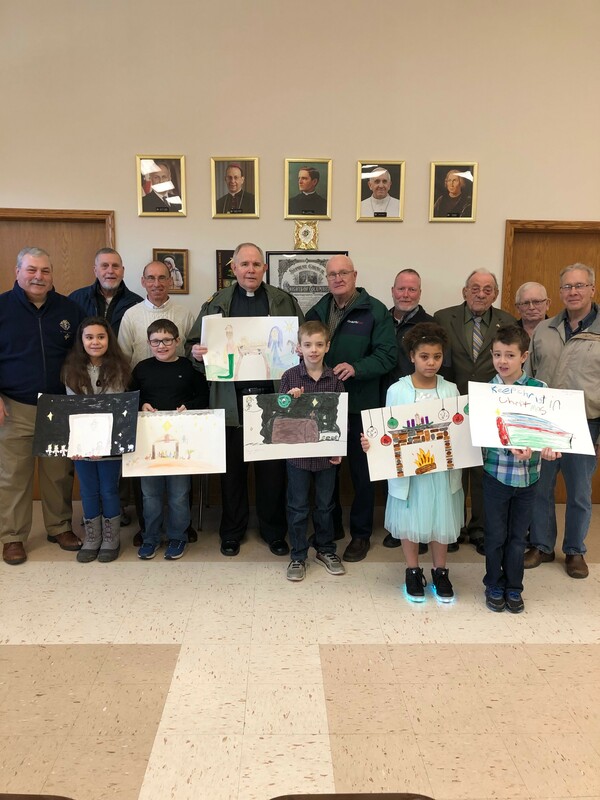 The Knights of Columbus Council of St. John XXIII #16090 from St. Bonaventure and St. Timothy parishes in Clearfield County honored several youngsters who participated in the Knights’ “Keep Christ in Christmas” coloring contest. The student-artists, pictured from left, are: Aryan Negado, Brody Kelly, David Magnuson, Adrianna McCracken and Peter Magnuson. (Absent from photo is Addyson Neiswender.) Also pictured are Knights Rick Carfley, Jerry McNaul, Bernie Carfley, Father Steve Collins (pastor), Tom Kubista, Sean Dunn, Harry Fye, Chuck Sipes and David Stricek. 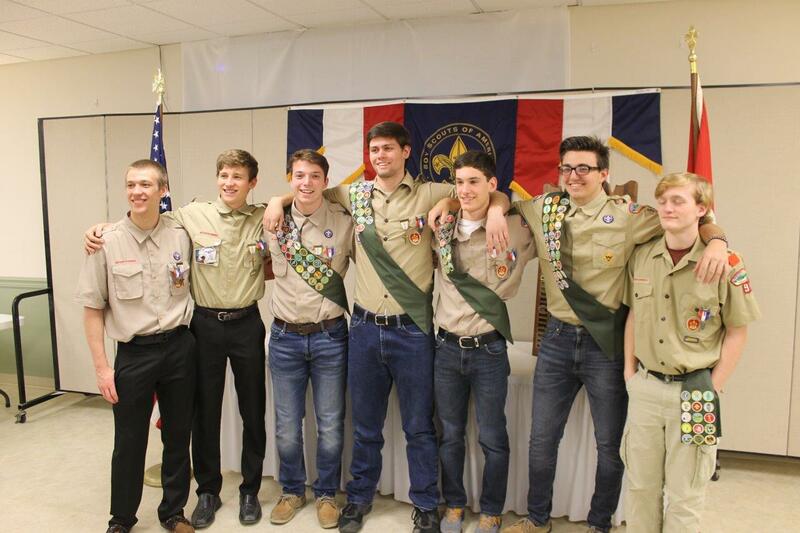 Eight young men from the Elk County parishes of Sacred Heart, Queen of the World and St. Mary’s, all in St. Marys, and St. Joseph in Force became Eagle Scouts in a ceremony Feb. 10. They represent Boy Scout Troop 95. Pictured, from left, are: Alex Breindel, Nick Daghir, Cody Ritter, Ben Sherry, Jacob Carnovale, Ethan Alexander and Luke Chileski. Congratulations on your years of hard work! The Secular Franciscans of the Canticle of the Sun Fraternity met at All Saints in Waterford for their monthly meeting in January. They gather together for prayer and formation each second Sunday of the month with their spiritual assistant, Sister Rose Kuzma, OSF. For more information about Secular Franciscans, call Mary Nelson at 814-472-4415. Pictured in the front, left to right, are: Mary Nelson, Chris Zurawski, Jeannette Briggs and Donna Roberto. In the back, from left, are: Burton Fish, Candy Henry, Harriet McClellan, Mary Lou Kreider, Mary Stewart, Diana Twaroski and Nancy Mattson. 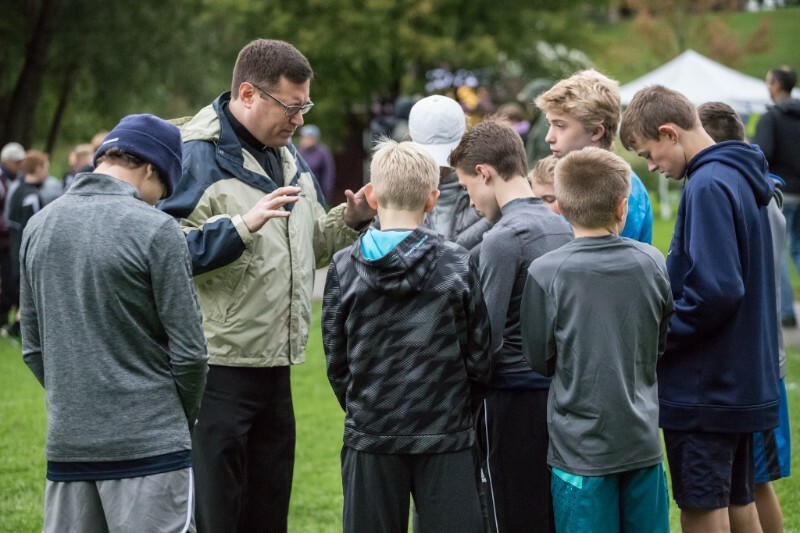 Fourth-, fifth- and sixth-graders from the faith formation program at St. Bonaventure and St. Timothy parishes in Grampian and Curwensville recently participated in their annual retreat. This year, they focused on the life and work of St. Joseph, the carpenter. 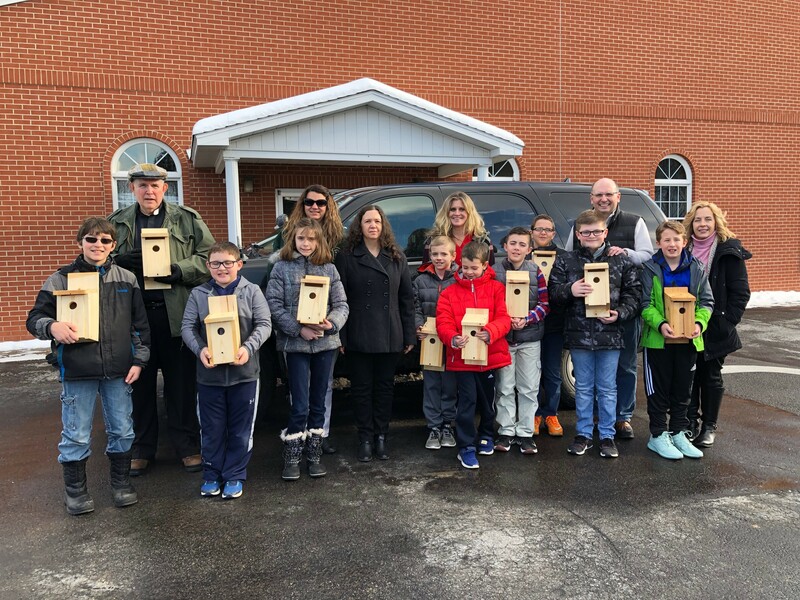 Guest speaker Mandy Marconi, environmental education specialist from the North Central Region Pennsylvania Game Commission, discussed the Pennsylvania Blue Bird Project. All the students then made their own bird houses. Pictured with the students. 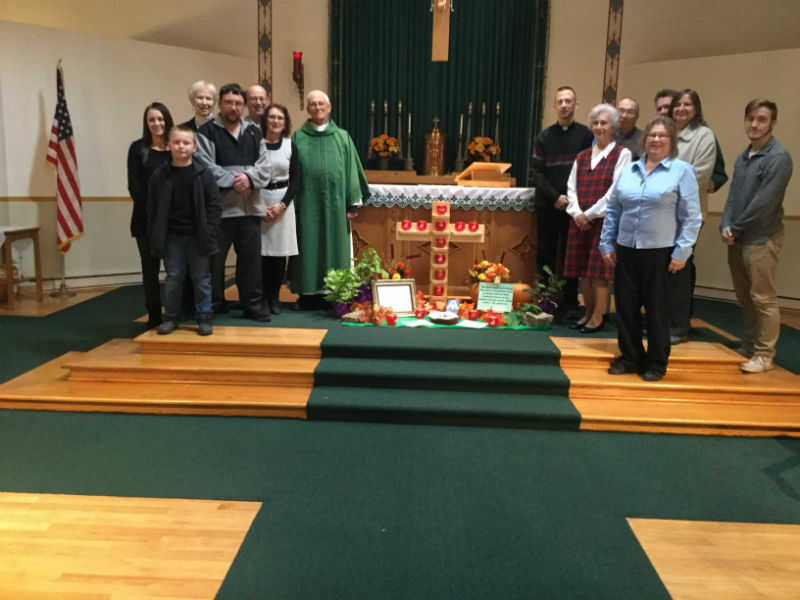 from left, are: Father Steve Collins, pastor; Marconi; and parents Yvonne Wink, Becky Magnuson, Frederick Neiswender and Lisa Beitz. 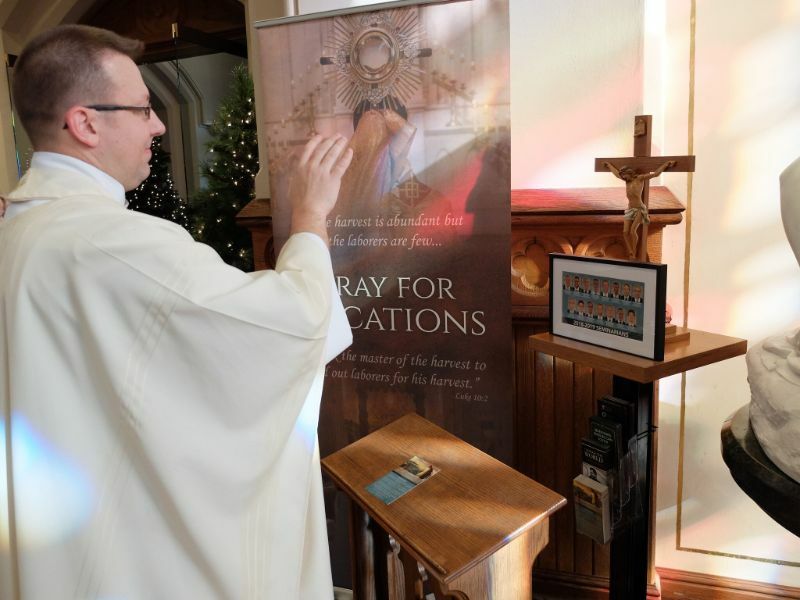 Father Michael Polinek, vocations director, blessed a new traveling vocation crucifix during a Mass and ceremony on Jan. 6 at St. Peter Cathedral in Erie. The crucifix serves as a reminder and provides a place to pray for the young men and women who are discerning their vocations. The vocation crucifix, designed and made by a member of the Serra Club of Erie, will be at St. Peter Cathedral for one month. After that it will be taken to another parish where it will be kept for a month before being moved to another parish. It is hoped that eventually the crucifix will travel to all the counties in the diocese. 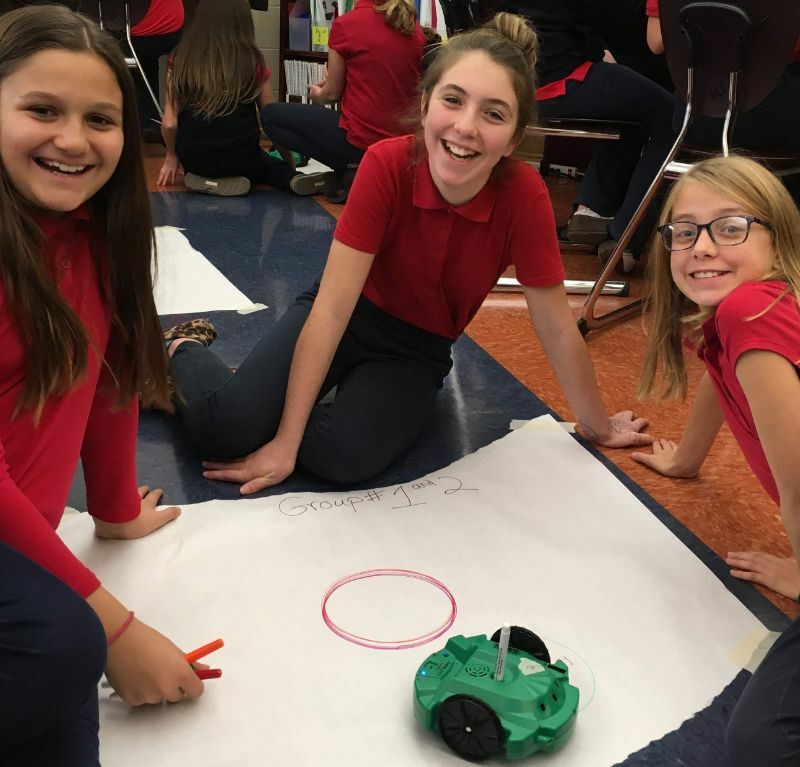 Fifth-graders Brooklyn Baummer-Vogel, Kairys Martini and Gabby Pisarcik, students at DuBois Central Catholic Elementary, are all smiles after properly coding their Scribbler Robot to draw a snowman, part of a monthly unit plan introducing younger students to the science of robotics. 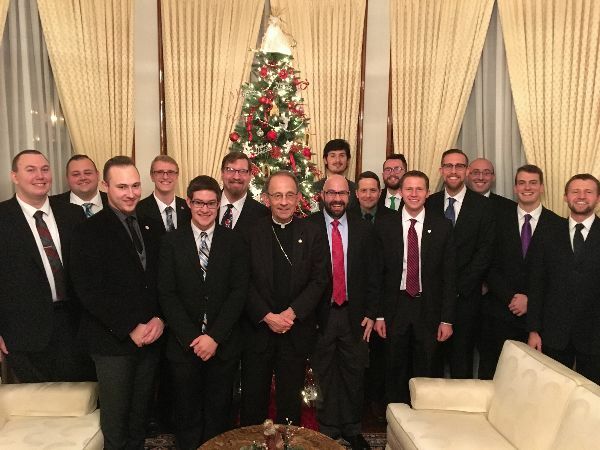 Bishop Lawrence Persico and seminarians gathered for an annual dinner on Dec. 14, 2018, at the bishop's residence. 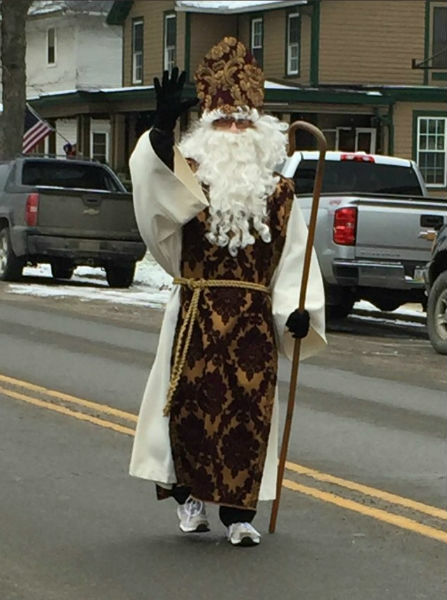 Father Paul Siebert of St. Mark Parish in Emporium donned a flowing white beard and sneakers as he transformed himself into St. Nicholas for the Emporium Christmas parade. 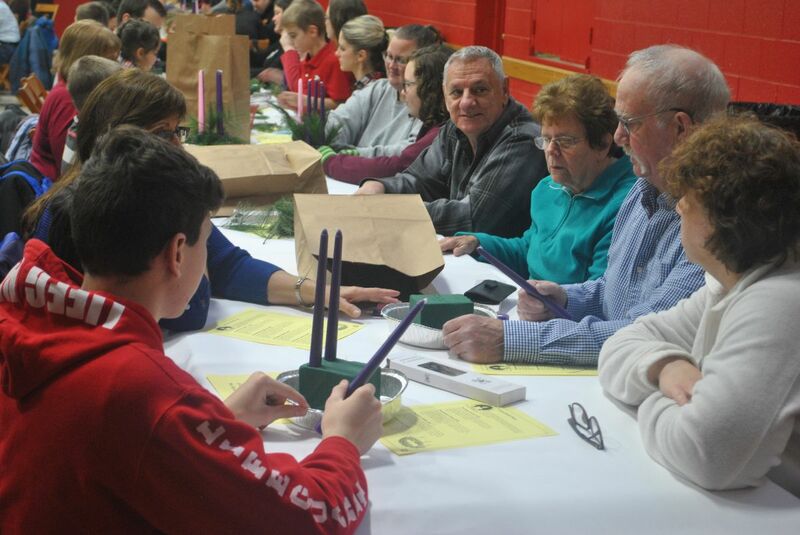 The Our Lady of Mount Carmel Faith Formation program held its first Advent Inter-generational event on Saturday, Dec. 1. 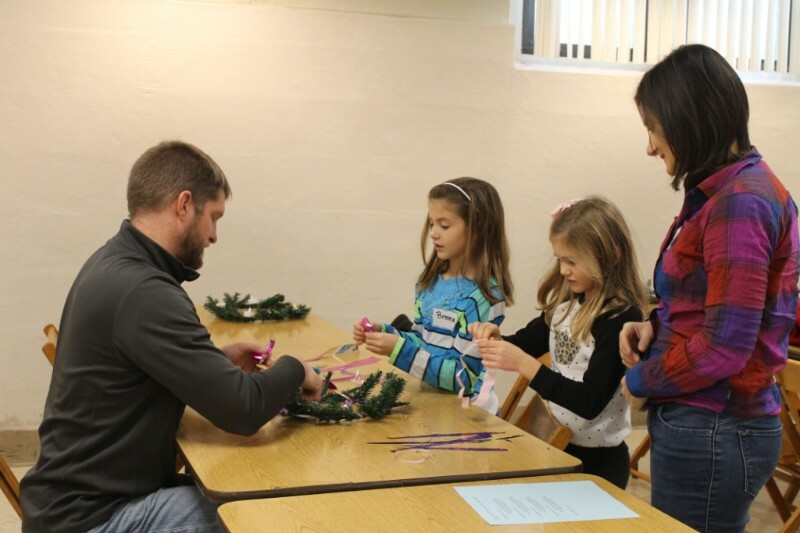 Families gathered to make Advent wreaths using real greens, celebrated Mass together and then enjoyed spaghetti together as a community. In attendance were 260 people, ranging in age from 2 months to 89 years old. A display and cross honoring deceased members of the Northern Moshannon Cluster is on display at Ss. Peter and Paul Church in Grassflat. Pictured in the first row, left to right: David Kinderberger, Mike Dudak, Debbie Saggese, Deacon Robert Hoover, Dorothy Fenush, Andrea Brnik (creator of the display) and Thad Butler. Pictured in the second row, left to right: Erica Kindelberger, Juda Harvey, Charlie Saggese, Father David Perry, Joe Fenush (creator of the cross), David Stinchcomb and Anita Stinchcomb. 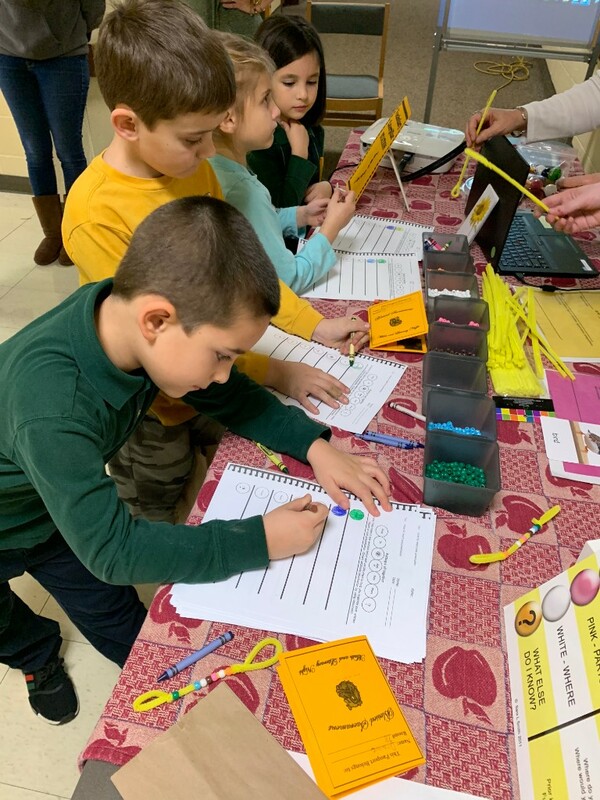 Students and parents had a chance to play math and reading games, learn how to read a recipe and make a snack, and learn activities that they can do at home at Blessed Sacrament School's recent Math and Literacy Night. “This is fun event for just about everyone in the family," Principal Jane Wagner said. "Students and parents alike get to learn and take part in educational-oriented games, and activities that will help grow learning in the classroom and at home." On Monday, Nov. 5, 2018, the Serra Club of Erie celebrated a Mass to pray for an increase in vocations to the priesthood and religious life. 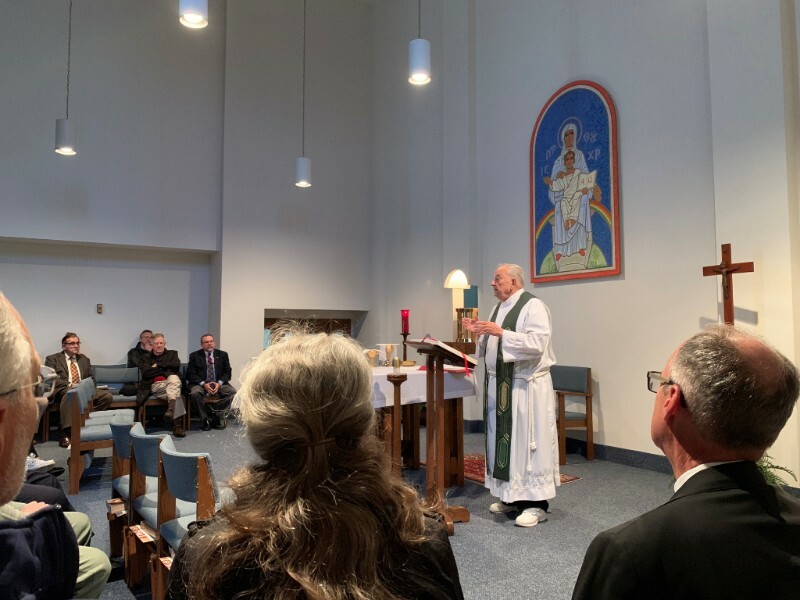 The Mass was held at Gannon University's Mary, Seat of Wisdom Chapel along with some members of the Gannon University community. Father Joseph Gregorek was the celebrant. Erie Serrans celebrate a memorial Mass at their November monthly meeting each year in lieu of hosting a speaker. DuBois Central Catholic participated for the first time this year in the annual National 9/11 Good Deeds Challenge. Shown here are several student organizers and event coordinator/teacher Tara Kramer, posing in front of one of the banners created by the art department to display the students’ good deeds pledge cards. Pledge cards were distributed through theology classes and students completed a signed pledge to perform a good deed in honor of victims of September 11, 2001. “9/11 Day is the nation’s largest annual Day of Service, recognized and established under federal law, and DCC was honored to be a participant in this year’s nation-wide remembrance," Kramer said. Msgr. 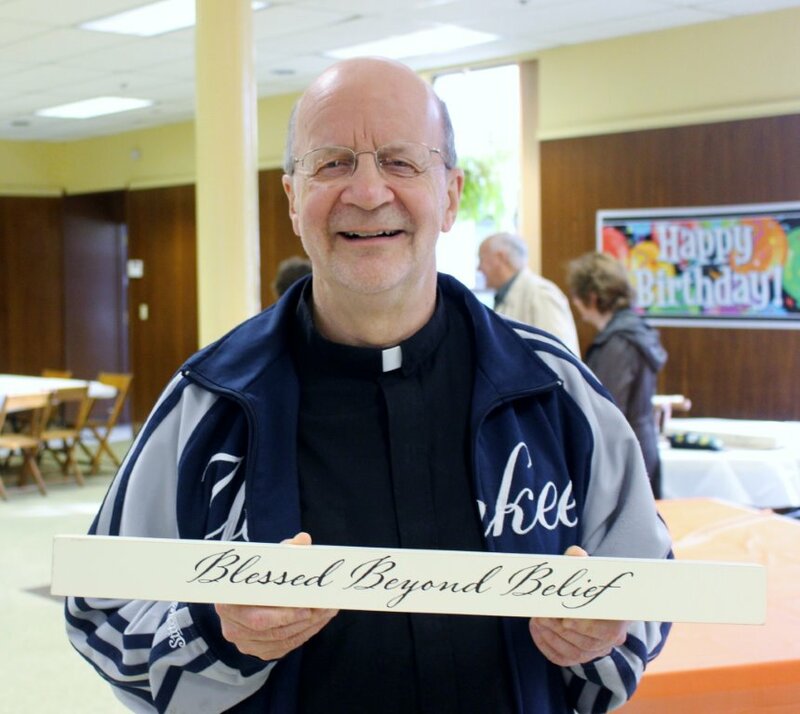 Richard Siefer, pastor of St. Catherine of Siena Parish, DuBois, and parochial administrator of St. Joseph and St. Michael parishes, both in DuBois, celebrated his 70th birthday Sept. 25. Two days earlier, his parish community feted him with a musical concert featuring the Brothers in Praise group from Harrison City, Pa., and an ice cream social. Besides parishioners, some close friends and family attended the event. 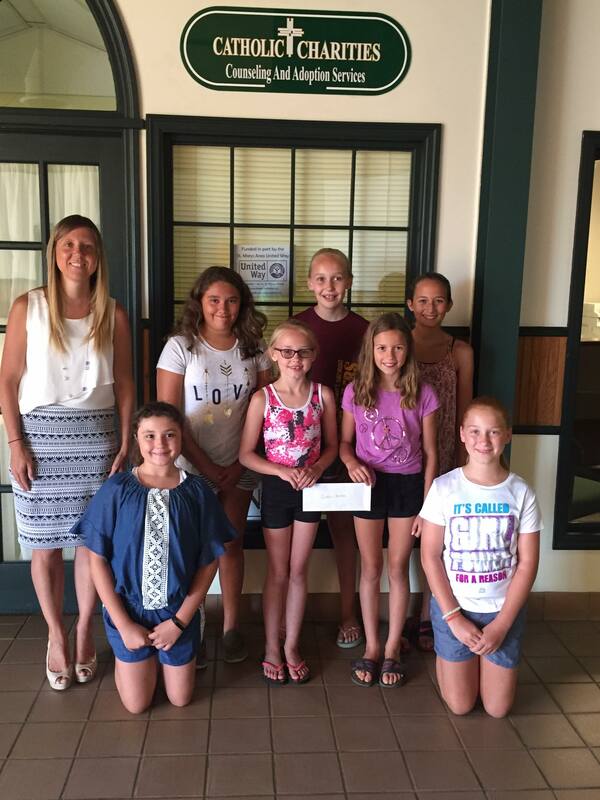 A group of St. Marys Catholic Elementary School students formed “The Butterfly Club” with the mission of performing service projects for the community over summer break. One of the group’s projects was a bake sale that benefited Catholic Charities Counseling and Adoption Services in St. Marys. The sale raised $272 for the organization. Pictured are Tiffany Boschert of Catholic Charities with Butterfly members, from left: Marissa Ullman, Gerrianne Vogt, Jaydon Gabler, Brooke Gabler, Elise Meyer, Olivia Meyer and Cecilia Dornish. Missing from the photo are Gianna and Sophia Bille. 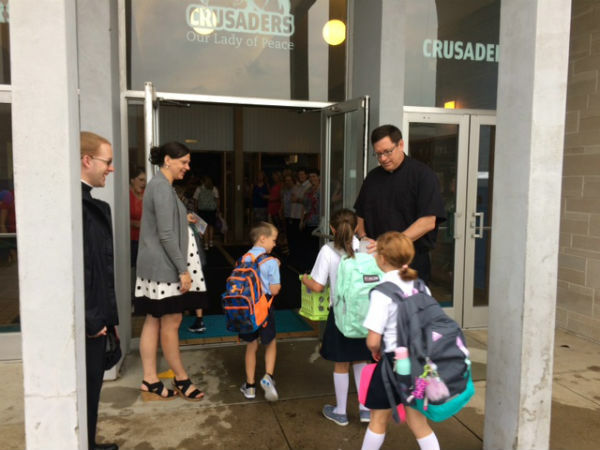 Hundreds of students headed back to class at schools throughout the diocese, ready to grow in faith, love and knowledge. 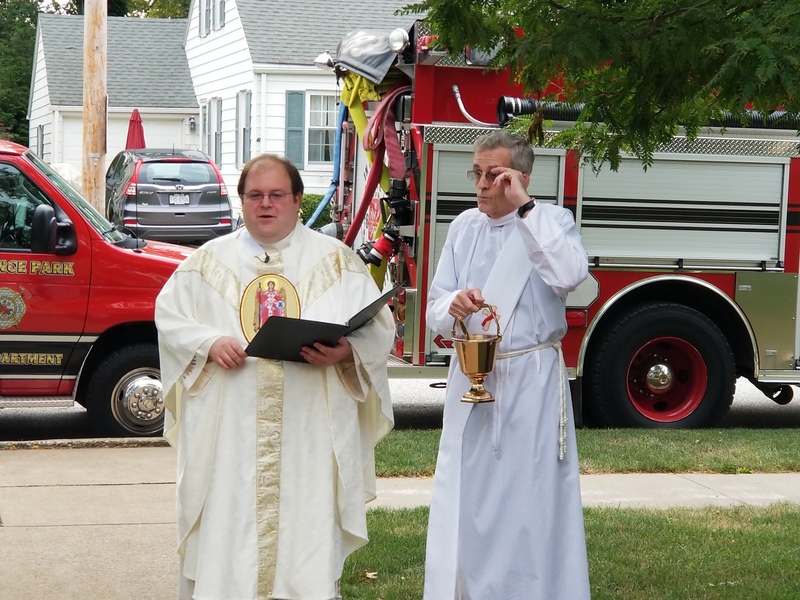 Father Tom Trocchio, left, pastor of St. Mark the Evangelist Parish in Lawrence Park, and Deacon Jim Moss lead the parish's first Mass recognizing the work of first responders Sept. 11. 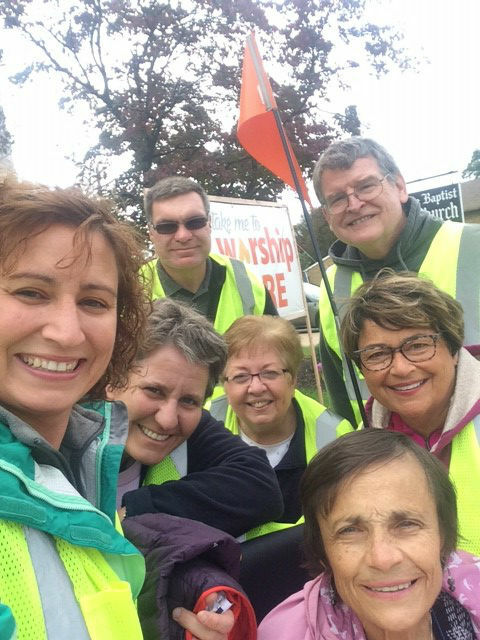 Many parishioners attended the event, along with the Lawrence Park Volunteer Fire Department, which brought all four of its trucks to be blessed, and the Lawrence Park Police Department, which brought a cruiser. A group of St. Marys Catholic Elementary School students formed “The Butterfly Club” with the mission of performing service projects for the community over summer break. One of the group’s projects was a bake sale that benefitted Catholic Charities Counseling and Adoption Services in St. Marys. The sale raised $272 for the organization. Pictured are Tiffany Boschert of Catholic Charities with Butterfly members, from left: Marissa Ullman, Gerrianne Vogt, Jaydon Gabler, Brooke Gabler, Elise Meyer, Olivia Meyer and Cecilia Dornish. Missing from the photo are Gianna and Sophia Bille. ERIE—Seventh-graders at Our Lady of Peace School in Erie recently planned and hosted a Math & Science Fun Day for the rest of the school community. After researching different grade-appropriate experiments, the seventh-graders set up stations in the school cafeteria. Pictured is seventh-grader Corey Webber, who demonstrates surface tension for first-graders Logan Delavern, Landon Kemmer, Nicholas Ehratic and Bode Dimperio. Webber shows how paper clips can float on the water surface. ERIE--The Serra Club of Erie recognized the contributions and good works of a religious sister, a lay person and members of the clergy June 5 at its annual banquet in the Yehl ballroom at Gannon University. The 2018 honorees are pictured, from left: Deacon Denis Coan, Deacon of the Year; Bishop Lawrence Persico, Priest of the Year; Sister Clare Marie Beichner, SSJ, Religious of the Year; and Ann Speice and John Speice, children of the late James Speice, recognized posthumously as Layperson of the Year. ERIE—Prince of Peace Center in Farrell is celebrating its 35th anniversary responding to the needs of the people of the Shenango Valley. To raise awareness of this outreach of Catholic Charities of the Diocese of Erie, the agency has started the online #IAMPOP initiative. During its semi-annual meeting of members, current board chair, Lisa Dach, second from left, presented members of the corporation with #IAMPOP shirts. CURWENSVILLE—The Knights of Columbus St. John XXIII Council #16090 of Curwensville/Grampian recently presented winter coats, sweatshirts, gloves and underwear for elementary-aged school children to the Curwensville Area School District. The donations are made possible through the Knights’ Kover for Kids Program. 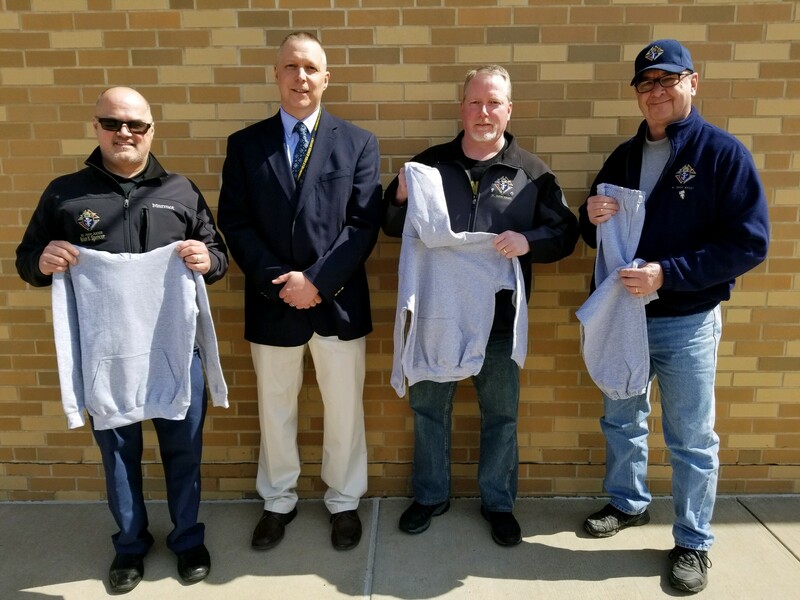 Pictured, from left, are Knight Brian Spencer, Superintendent Ronald Matchock of the Curwensville Area School District, and Knights Sean Dunn and Pete Petrone.